Visiting the dentist: it’s something that no one necessarily wants to do, but it’s something that everyone should do. Now, as your cosmetic dentist in Garden Ridge, we’re naturally inclined to say that everyone needs to visit the dentist for good, long-lasting oral health, but it’s true. You do really need to see the “tooth doctor” at least once or twice a year. Oral Care Matters — Our Garden Ridge Cosmetic Dentists Can Help! But again, despite the importance of oral care, visiting the dentist can be a flat-out dreadful experience for many people. Here at Smile Makeover Specialists, we’re excited to say that the experience doesn’t have to be all doom and gloom. In fact, you can have a completely pleasant time when visiting our cosmetic dentistry practice near New Braunfels and San Antonio. Below, you’ll find a few useful and practical ways to manage pre-dentist anxiety. Our goal is for you to feel comfortable about your visit with Dr. Thames and the team at Smile Makeover Specialists, so if you need anything at all or you have any questions about our services, don’t hesitate to get in touch with us! When we’re fixated around a particular fear or bearing through something that’s unpleasant, we tend to either breathe fast and hard, or forget to breathe altogether. In either case, you’re naturally elevating your panic and stress levels. Try to take some slow, meditative breaths to help you calm down and relax. Controlled breathing works! Remember, you’re visiting our cosmetic dentists for a reason — or even several reasons, especially if you’re coming in for a general cleaning and a cosmetic procedure consultation. Your visit certainly isn’t all for nothing, and after some friendly back and forth conversation (muddled by the fact that your hygienist’s gloved hand is likely somewhere in your mouth), you’ll be out of here in no time with a renewed sense of confidence and oral health. When we bottle something inside of us, it tends to build pressure and causes our anxiety levels to rise. Being afraid of the dentist or even just dreading your visitation isn’t uncommon, and you shouldn’t be embarrassed or ashamed about discussing your concerns with us. It feels good to establish an open and honest line of communication with people who care, so don’t think that you’ll bother anyone by asking questions and communicating that you’re nervous. We’re here for you! 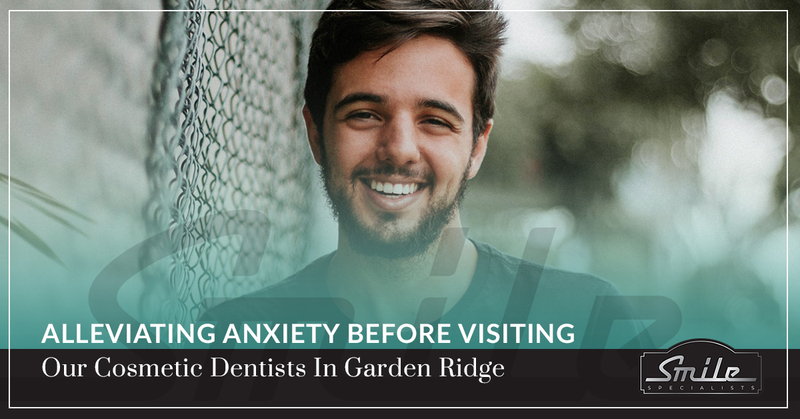 With multiple sedation methods available, our dentists in Garden Ridge can help calm you down when other methods just aren’t effective. Sedation dentistry is not only highly effective in its own right, but also completely safe. Visit the link above to learn more. Schedule An Appointment With Smile Makeover Specialists Today! Our dedicated and expert team, combined with the latest dental technology, makes for a comfortable and unbeatable dentist visit. Our success lies in your success! Contact our cosmetic dentists in Garden Ridge today to get started. Check Out Our Smile Gallery Here!